The Tabernacle Courtyard and Outer Gate—YESHUA, YESHUA, YESHUA! Exodus 27:9–19, Court of the tabernacle. The tabernacle’s outer court was approximately 150 feet long by 75 feet wide (or 11,250 square feet, which is about one-fourth of an acre) in size. The curtains of the outer court (Exod 27:9–19) were made of fine white linen and was seven-and-a-half feet tall. The linen curtains speak of robes of righteousness the bride of Yeshua will wear on her wedding day (Rev 19:8). Sixty pillars supported the outer curtain. They were set in heavy bronze (or brass) bases topped by silver capitals. These pillars represent redeemed humanity wearing robes of righteousness. Wood symbolizes humanity, while bronze symbolizes judgment against man because of sin, and silver represents redemption or Elohim’s ransom price for man’s sin. The Outer Curtain in More Details. The outer curtain was approximately 150 feet long by 75 feet wide and seven and-a-half feet tall. The curtain was just tall enough so that a tall man could not look over the top and see inside. The curtain was made of fine-twined white linen which stood in stark contrast to the surrounding gray-brown drab desert surroundings. White linen represents robes of righteousness. The priests wore white linen robes (Exod 28:39–43) and the bride of Yeshua is expected to wear such garments (Rev 19:8). YHVH’s people are called a nation or kingdom of priests (Exod 19:6; 1 Pet 2:9; Rev 1:6; 5:10; 20:6). Men’s righteousness is as filthy rags (Isa 64:6) and our sins have separated us from Elohim (Isa 59:2), but YHVH has made provision for man’s sins to be washed away and for man to become white as wool or snow (Isa 1:18). This curtain formed a barrier between man and Elohim, between the profane or polluted and the sacred and pure. The height of the curtain was just a little taller than a tall man to teach unsaved man that the way of salvation is not impossible for him to achieve, yet it is just beyond his reach, as well, without coming through the prescribed way—through the door of the curtain. The curtain was supported by 60 (6 x 10) pillars. Six is the number of man while ten represents ordinal perfection. The pillars were set in bronze bases and capped with silver capitals. Bronze represents Elohim’s judgment against man’s sin and silver represents redemption or sinners being redeemed from deserved judgment (Ezek 18:4; Rom 3:23; 6:23). Examples of bronze representing sin and judgment include the brass serpent on the pole in Numbers 21. This was a picture of Yeshua taking upon himself the judgment for man’s sins (John 3:14-17). The silver capitals represent the ransom price YHVH laid upon each of the children of Israel age 20 and upwards (Exod 30:11-16). The small amount of silver each Israelite paid for a ransom for their sins was but the minimum amount due on each person’s huge and impossible-to -pay sin debt charged on each man’s spiritual credit card. Thankfully, Yeshua redeemed each sinner not with gold or silver, but with his precious blood (1 Pet 1:18-19). The ropes holding up the posts and pillars were made of goat hair. This is another picture of the redemptive sacrifice of Yeshua and of the price of man’s sin paid by his shed blood. The outer curtain was white and luminescent from the light of the glory cloud; approximately seven-and-one-half feet tall so that an ordinary man could not peer over the top; the only access in was through the gate. This glowing curtain separated the bleak and drab wilderness outside from the paradise inside; darkness from light, profane from the set-apart (kadosh), death from life, confusion from order. The gate was a four-colored woven tapestry representing the Person and work of Yeshua: purple for royalty or kingship, white for righteousness, blue for divinity or heaven and red for blood; Yeshua is the door of the tabernacle or sheepfold—he is the way to the Father, the way, life and truth; the gate was wide, but not tall­—just above the height of a tall man; it was the only way into the tabernacle. Exodus 27:16–17, Gate of the court. The door of the outer court curtain contained three colors woven into white linen fabric: blue, purple, crimson, and white. These four colors speak of different attributes of Yeshua, whom Scripture likens to the door of salvation (John 10:1–18). These four colors combine to form a full picture of Yeshua, the Redeemer and Savior of Israel. Only through him can man come to the Father, have salvation, eternal life and inhabit the glorious New Jerusalem pictured by the glory cloud over the Holy of holies in the tabernacle. The four colors also correspond to the four faces of the living beings around the throne of Elohim (Ezek 1). 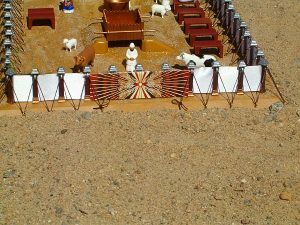 This entry was posted in Weekly Scripture Readings and tagged Tabernacle of Moses by Natan Lawrence. Bookmark the permalink. I was wondering about all the numbers and their Hebrew letter equivalents and what it might spell/mean if anything? I understand this only at a most limited and basic level. Doubtless, there’s much more to learn that we don’t know relating to the numbers. Have tried to use the link as I found it interesting and was wanting to see if I could find out more about Theophilus as the High Priest of the Saducee Sect but the link came up as server not found when I copied and pasted. It would not operate either when I shortened it to the .org area either. I had never come across Luke’s account as being to such a one as this before and thought you may have already come across Theophilus as being this particular person in another source that I may get a hold of. Hope you can assist and thankyou again for your thought provoking commentary on the Torah portions. I am still trying to grasp hold of the Hebrew depth levels of study and revelation and find as in all things El’s timing is perfect to reveal to each of us more of what we need to know. 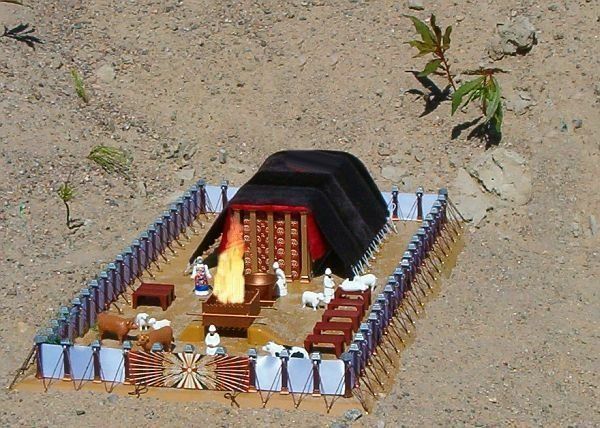 Shalom and Shavua Tov to all In Messiah and all coming to the knowledge of Salvation in Him.